Anti-fatigue mats come in a lot of shapes and sizes, but they’re all made to massage, de-cramp, and take the tension out of your legs and feet. They’re all cushioned, but they also have ridges, balls, and platforms that can actively put some pressure on those toes. Sounds better than the carpet, right? If you don’t have a standing desk, you could still benefit from one of these mats. Everybody likes a good foot massage, especially while they’re supposed to be working. If you want a comfortable, simple anti-fatigue mat, then you should check out the VARIDESK ActiveMat Groove. It’s a wide, cushioned (yet firm) standing mat with a small center groove. 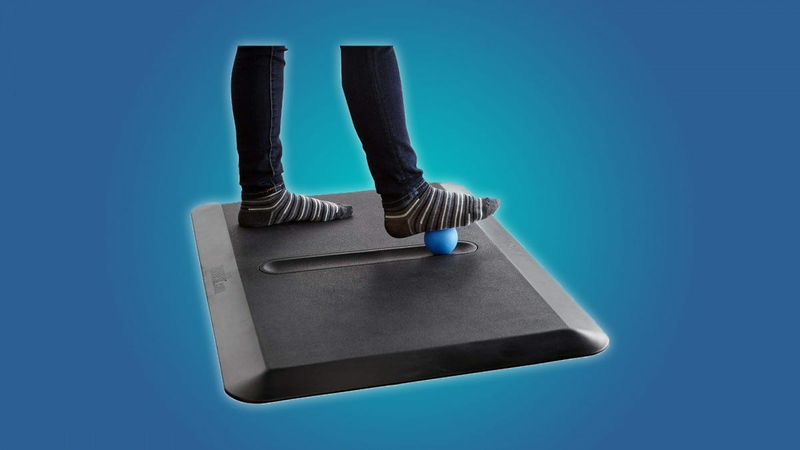 This groove is meant to hold the VARIDESK mat’s rubber balls, which you can use to massage your feet and get the blood moving through your legs while you work. Interestingly enough, the VARIDESK anti-fatigue mat comes with three rubber balls. One of the balls is dense, the other is medium-firm, and the final ball is nice and soft. If you’re prone to foot and leg cramps, you could use the dense rubber ball to really put some pressure on your feet. Or, if you need to fidget while you work, you could just stick to the softer ball. Given the practically universal design of the groove though, you can pretty much put anything round in there you want. Tennis ball? No problem. Stone ball to really put the deep-tissue-massage hurt on your feet? 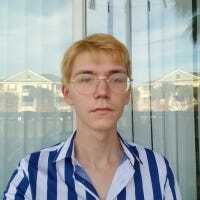 You can do that too. 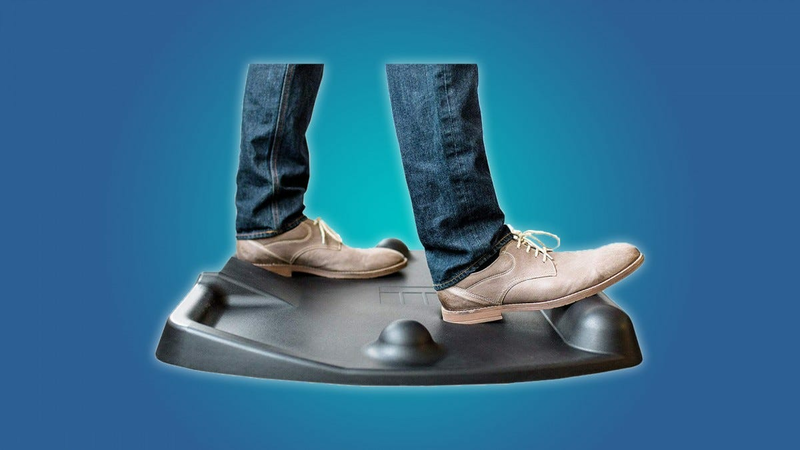 This is a great standing desk mat, especially if you’d like to choose whether or not your feet get a workout. The rubber balls (and the groove that’s in the mat) are really unobtrusive, but they’re easy to use when your legs get tired. Not to mention, the VARIDESK mat is nice and wide, so you can fidget around a bit without falling off. If you’re looking for a rough and tough anti-fatigue mat, then you should check out the Anypro standing desk mat. It’s a durable, ergonomic mat that encourages you to stand in dynamic positions while you work. The Anypro mat is lined with ridges, so you can stretch your muscles while you stand and put some muscle-relieving pressure on your arches. 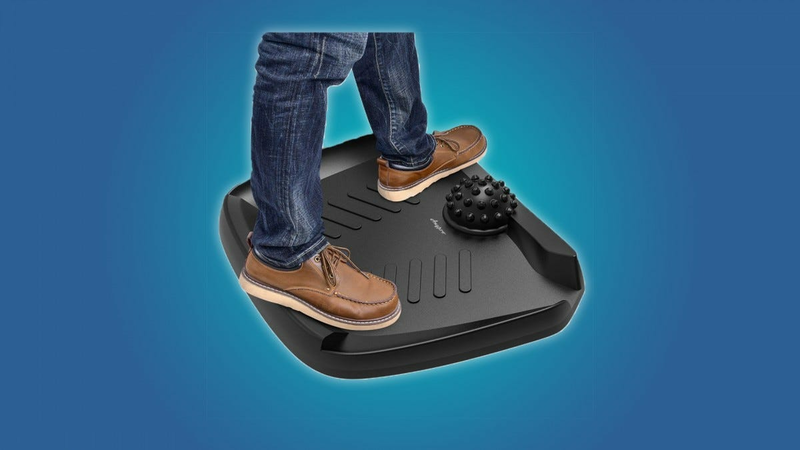 Additionally, the Anypro mat has a ribbed rubber ball for deep foot massages and fidgeting. This is a great mat for anyone who forgets to stretch while standing at their desk, or for people that need to fidget and change positions to keep their legs comfortable. If you’re just trying to find a comfortable standing position, then you should check out the CubeFit Terramat. 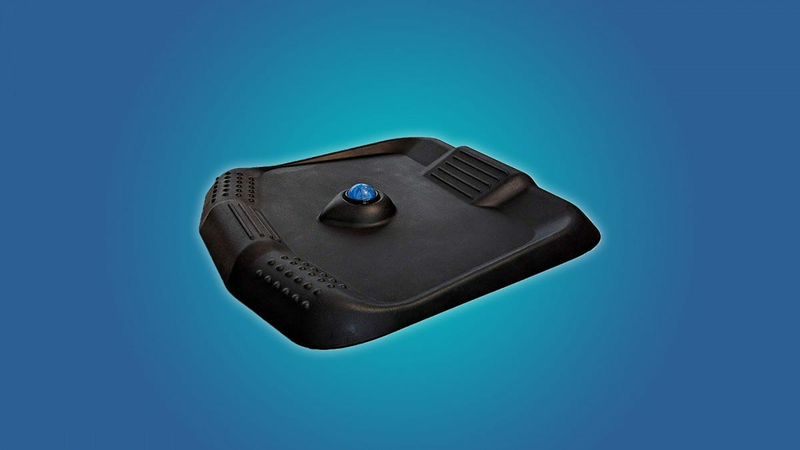 This mat is focused on ergonomics and doesn’t put a large emphasis on massaging balls or ribs. The CubeFit Terramat is ergonomically designed, with a cushioned center, and various firm inclines and declines around the edges. 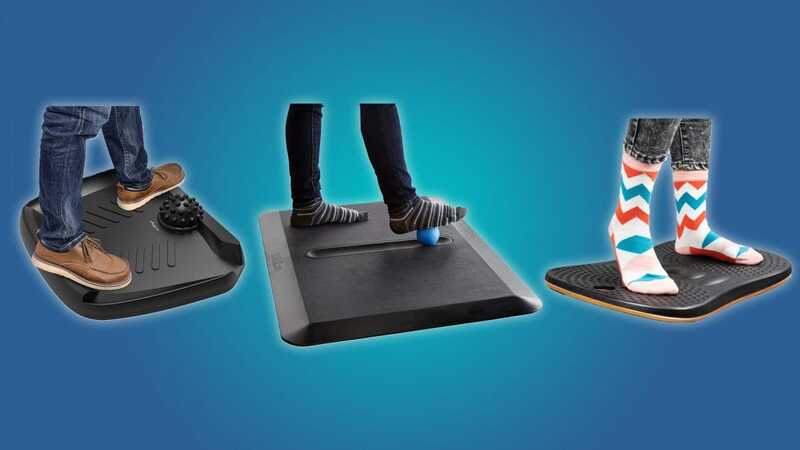 Additionally, the CubeFit Terramat has two mounds that can be used to rub your feet, but they’re off to the side so you can focus on finding a comfortable standing position. The Sky Solutions Genius Mat looks like a giant trackball, but it’s actually a compressive, comfortable standing desk mat. The center of the Sky Solutions Genius Mat is nicely cushioned, but the mat’s perimeter is firm, with varying inclines and ribs for deep stretches or casual (yet dynamic) poses. In the absolute center of the Sky Solutions mat lies a plastic foot massage ball. This rollerball is unobtrusive while you’re working, but it’s easy to reach when your feet start to feel a little tense. The FEZIBO wooden rocker is a bit of an outlier in the world of anti-fatigue mats, but it’s good for people that want to improve their standing posture and keep their feet limber. The FEZIBO is technically a wooden balance board that’s redesigned for use at a standing desk. 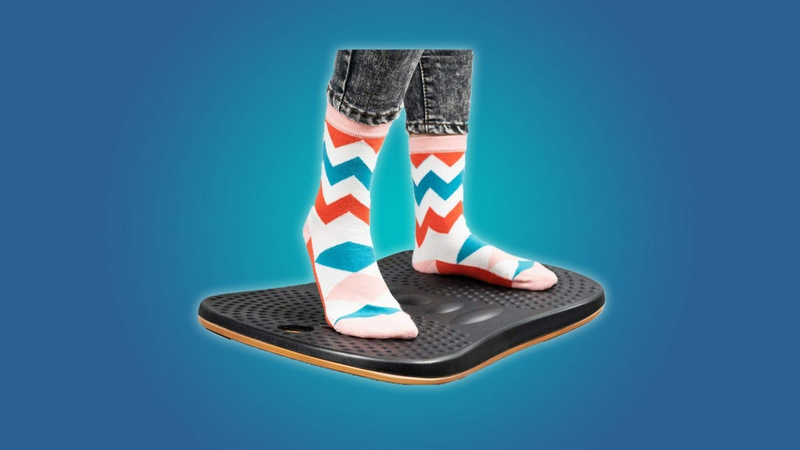 It’s easy to balance on (just stand up straight), and it has some small rubber dimples so your feet don’t slip. Of course, balancing boards aren’t for everyone. The FEZIBO rocker doesn’t have the massaging capabilities of other anti-fatigue mats, but it’s a great tool to improve your posture and get your blood flowing a bit.